It is replaced by the Intermec EasyCoder PX6i. Intended for users that require 6" wide labels or tags. The Intermec EasyCoder 3600 is a versatile industrial strength printer based on the legendary 3400, intended for users that require 6" wide labels or tags. The EasyCoder 3600 is ideal for wide-format compliance shipping and container labels, such as ODETTE. Printing large text for applications requiring maximum readability such as chemical drum or pallet labeling is easy using the large outline font included on the EasyCoder 3600. All units ship with product documentation. Includes Intermec LabelShop START barcode label design software. Thermal transfer, 203 dpi, 5 ips, 6.6" print width, Ethernet & serial interfaces, 512KB NVRAM. Includes US power cord. Order cables separately. See accessories. Thermal transfer, 203 dpi, 5 ips, 6.6" print width, Ethernet & serial interfaces, 128KB NVRAM. Includes US power cord. Order cables separately. See accessories. Thermal transfer, 203 dpi, 5 ips, 6.6" print width, parallel & serial interfaces, 512KB NVRAM. Includes US power cord. Order cables separately. See accessories. Thermal transfer, 203 dpi, 5 ips, 6.6" print width, parallel & serial interfaces, 128KB NVRAM. Includes US power cord. Order cables separately. See accessories. 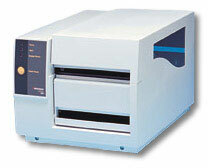 Thermal transfer, 203 dpi, 5 ips, 6.6" print width, serial interface, 512KB NVRAM. Includes US power cord. Order cables separately. See accessories. Thermal transfer, 203 dpi, 5 ips, 6.6" print width, serial interface, 128KB NVRAM. Includes US power cord. Order cables separately. See accessories.